TELE has new phase monitors for voltage and phase sequence monitoring: E1PF480Y/277VSY10 and E1PF480Y/277VSY01 with adjustable asymmetry and selectable trip delay in the program. These devices are designed for universal use in networks of 208V to 480V. The measured voltage is also used as a supply voltage. Both units have a change over contact to report errors or direct switching of contactors. The energized relay signals that the symmetry and sequence of all phases is operating within correct parameters. 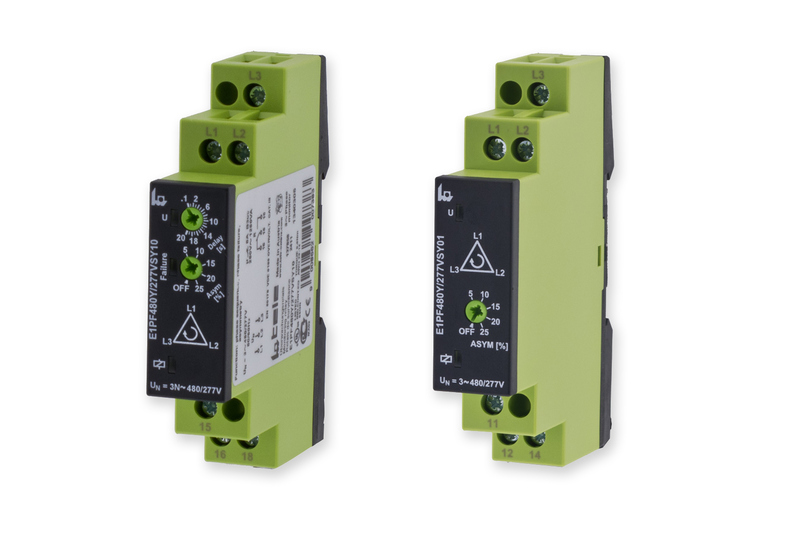 If an error occurs, the relay switches to “off” position. The permissible asymmetry can be adjusted according to network conditions in around 5 – 25%. If necessary, the asymmetry monitoring can be disabled if phase sequence only is being monitored. For mobile applications, it is often useful to determine, at the plant, the direction of rotation before operation commences. This is particularily useful, for example, in compressors with self-cooling. The direction of the rotating field from the power supply must be given special attention. Asymmetries in the network can cause problems in consumer loads. With the phase monitor complete protection can be built, in combination with an installation contactor, to prevent damage caused by faulty power. The E1PF, itself, can remain in an asymmetric network supply without damage thanks to an engineered 3-phase power supply. This means the phase monitor network can be connected, before the switch contacts, to free the supply in correct conditions. A phase loss in the lead in induction motors, in a delta circuit – despite feedback voltage from a rotating motor rotating field in the asymmetry evaluation – is reliably detected. To comply with permissible operating voltage ranges, TELE has the multifunction voltage monitor E1YM480Y/277VS10 in its product range. Functionality is enhanced by adjustable thresholds (min/max) and trip delay in order to fit a range of applications, for example: heat pumps. Due to their slim design of 17.5mm and UL approval, these devices are suitable for worldwide installations such as control and terminal boxes.